The Global Volcanism Program has no activity reports for Gamchen. The Global Volcanism Program has no Weekly Reports available for Gamchen. The Global Volcanism Program has no Bulletin Reports available for Gamchen. Andreev V I, Litasov N E, Puzankov Y M, 1988. Radioactivity of the basalt-dacite and andesite suites of the Gamchen volcanotectonic structure. Vulc Seism, 7: 219-233 (English translation). There is no Deformation History data available for Gamchen. There is no Emissions History data available for Gamchen. 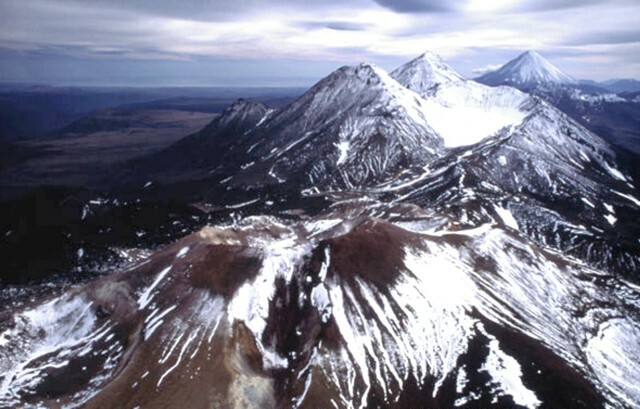 The Komarov volcanic complex is seen in the foreground in this view from the north toward the southern part of the Gamchen volcanic range. Komarov, the youngest cone of the complex, was built at the western end of a 2.5 x 4 km caldera. It is capped by two craters, one at the summit and the other on the upper east flank. The Gamchen massif beyond Komarov consists of three Late-Pleistocene and one Holocene cones. The perfect cone of Kronotsky volcano is seen on the far right horizon. 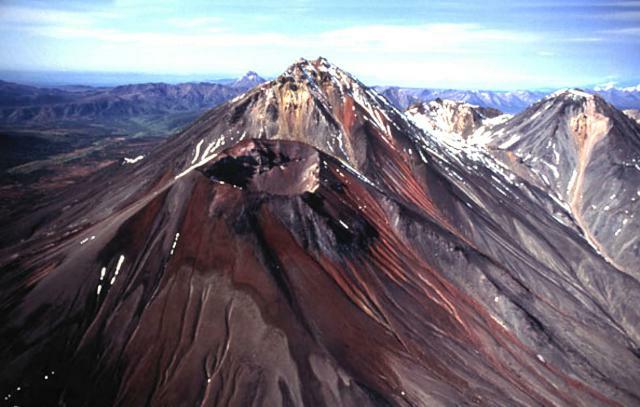 Copyrighted photo by Philippe Bourseiller (Holocene Kamchataka volcanoes; http://www.kscnet.ru/ivs/volcanoes/holocene/main/main.htm). The Gamchen volcanic massif, consisting of one Holocene and three late-Pleistocene cones, is seen from the SE. The reddish Holocene cone in the foreground, capped by a 500-m-wide, 200-m-deep crater, is named Barany (or Baranii, meaning "Sheep's"). Stratigraphic evidence indicates that it grew in several spurts of activity 3600-3000 years ago. Yuzhny Gamchen (center) forms the high point of the Gamchen massif. Kizimen volcano is seen on the distant horizon left of Gamchen's summit. There are no samples for Gamchen in the Smithsonian's NMNH Department of Mineral Sciences Rock and Ore collection. Large Eruptions of Gamchen Information about large Quaternary eruptions (VEI >= 4) is cataloged in the Large Magnitude Explosive Volcanic Eruptions (LaMEVE) database of the Volcano Global Risk Identification and Analysis Project (VOGRIPA).